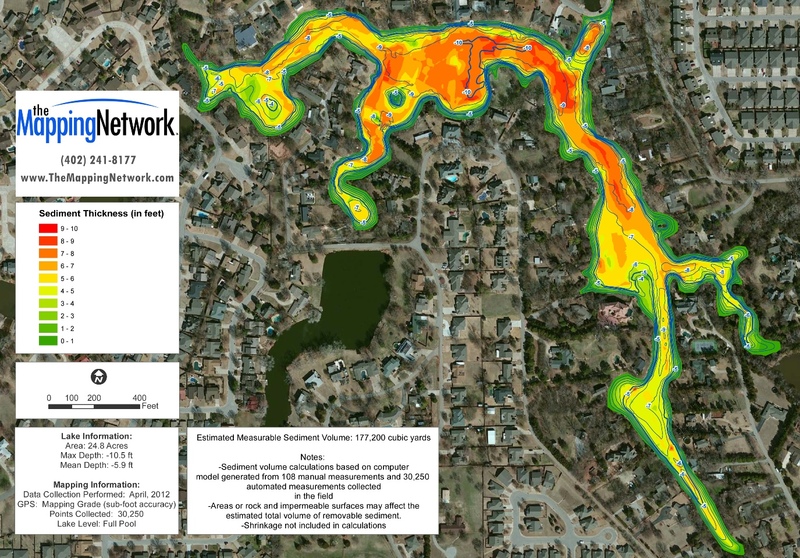 We recently worked with Lakeside on Preston HOA, in Plano, on their dredging project. The lakes in the community were approaching 18 years old and sediment had accumulated in the lakes to the extent islands had formed as if there were underwater volcanoes erupting and new land was emerging! Lakeside knew dredging was imminent, so they called several dredging contractors and asked them to submit quotes to perform the work. What they received from the contractors was a multitude of different opinions on what the lake bottom looked like and what needed to be dredged. As a result, they had many different quotes to choose from. But, what was the right choice? Our work began when the lakes and landscape committee chairman called us for help. Mapping the lakes was the best option for fully understanding the severity of the sediment issues. Once the maps were complete, a meeting was organized to review the maps and determine the areas the HOA deemed most important to dredge. This would help focus the dredging efforts and help reduce overall dredging expenses. 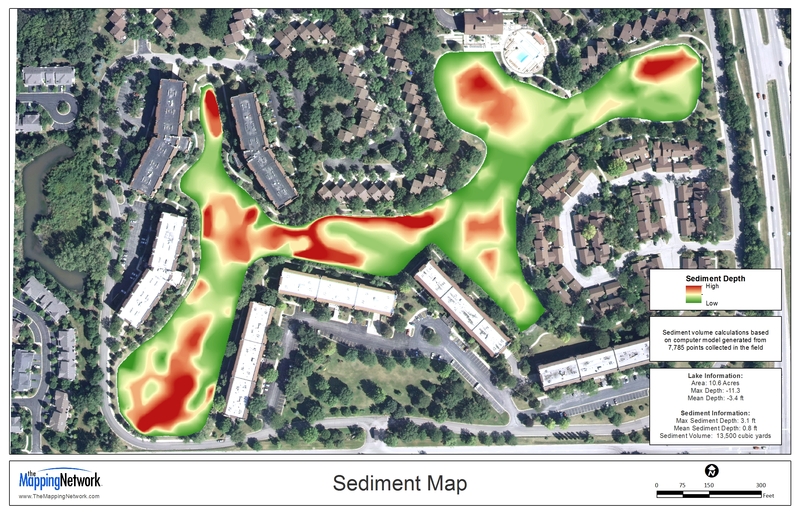 Using the data we collected to make the bathymetric map, we were able to calculate the cubic yardage of sediment needed to be removed in the critical areas the HOA identified. Now, Lakeside on Preston had objective, hard data from which to ask for dredging quotes. It was no longer subjective to what the dredging company thought needed to be done. For the first time in the Lakeside dredging project, the community was at the helm. The critical dredging area data was tabulated, formatted into a visual exhibit, included in a new Request for Proposal (RFP) and present to the dredging contractors. The new dredging proposals were received two weeks later and reviewed. The first time Lakeside did this, they received quotes that varied in excess of 300% from one contractor to another. This time, after our new RFP was sent out, we received quotes that were within several thousand dollars of each other. Finally, Lakeside was able to compare “apples to apples” between dredging contractors. Why? All the contractors were all looking at, and bidding from, the same data. Shortly thereafter, Lakeside on Preston chose a dredging contractor to perform the work and dredging began. PondMedics stayed on to assist the HOA with the project administration. The dredging contractor used the maps to help locate the areas they were contracted to dredge. When all the lakes were completely dredged, we re‐mapped the lakes. Because we were able to map the lakes prior to dredging, we could now provide Lakeside on Preston HOA a complete set of “before and after” maps. An otherwise unseen world, was now revealed to the community and everyone was able to see the underwater changes. Lakeside on Preston will present the completed project to the residents during the spring Annual Meeting, using the before/after maps to demonstrate to the residents how their money was used effectively in this dredging project and how the lake maps saved the POA hundreds of thousands of dollars. A color-shaded sediment map created by The Mapping Network. Our automated sediment mapping system can precisely locate problems areas needing to be dredged. Knowing exactly where to remove sediment not only saves the client money, but protects the environment by limiting the extent of the dredging footprint. This entry was posted in Lake Map, Sediment and tagged aerial lake map, Aerial Map, Bathymetric Map, Bathymetry, Dredge, dredge cost, dredge plan, Dredging, Fishing, GPS, GPS Lake, GPS Map, Habitat, hydrographic survey, hydrography, lake dredge, Lake Management, Lake Map, Lake Mapping, Lake Survey, Sediment, sediment removal, sediment removal cost, Sedimentation, Survey, texas fishing, Texas Lake Map, Texas Map, The Mapping Network, Waterfowl on July 23, 2012 by Moderator.